Everything was quiet and peaceful in the house until Little Monster arrived. Little Monster Did It by Helen Cooper is a wonderfully illustrated picture book for younger readers. I would say under six's would get most enjoyment out of it, and of course, us older folk too. Especially in the fine detail of the artwork which is not intensely coloured, but instead, by using muted hues, their impact is quite striking and...thoughtful. It's difficult to explain. The colours used throughout made me want to pause in my consideration of them, they drew me in, which I really liked. Amy loves her mum and dad and loves the time they spend together. She likes that it's only the 3 of them. But when her mum goes to hospital, after giving Amy a large Little Monster as a present, and she comes back with a new baby, needless to say, Amy is not best pleased. And Little Monster is deeply upset. He throws tantrums and makes a noise when the baby wants to sleep. When they all cuddle in with mum and dad and the new baby, Little Monster spitefully opens the hot water bottle in the bed and empties it all out. Of course, all his naughty actions are blamed on Amy. It is a very fast read, mostly because the pictures themselves tell most of the story - the prose is light and clever, but not as clever as seeing Amy's naughty face peer out from behind the tv watching Little Monster push donuts into the VCR. The expression is surprisingly sly and naughty and works so well. I know exactly what Amy was going through and although I didn't have Little Monster, I acted very badly towards my nieces and nephews until I realised that they would become my best friends forever. All I had to do was give them a chance. 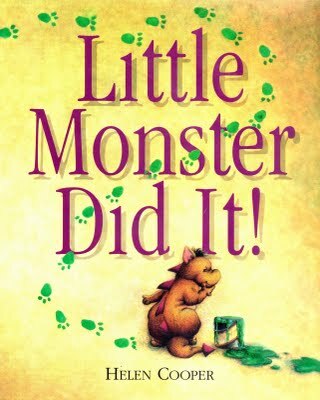 Little Monster Did It is a clever book for young readers struggling to cope with a new addition to the family or an upcoming new addition to the family. It makes them stop and think and it made me, as a reader, feel very nostalgic for my own overly busy childhood with hordes of nieces, nephews and cousins underfoot. Find Helen Cooper's website here. 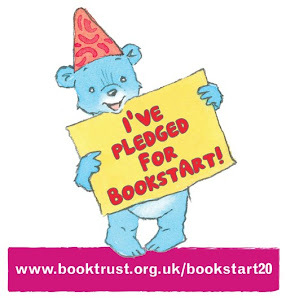 A bit thanks goes to Random House who have listened so kindly to my pleas for more picture books to be sent. They give me immense enjoyment and I find my wishlist of picture books growing and growing!